My love affair with pink bathrooms is a new one. 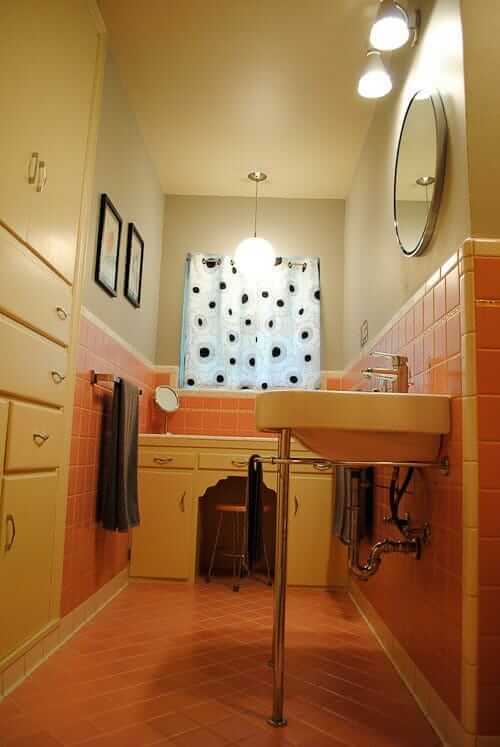 I never once thought about wanting or needing a pink bathroom when my husband and I first started searching for a mid-century ranch three years ago. Had I known then what I know now, I might have held out until I found the perfect time capsule bathroom. 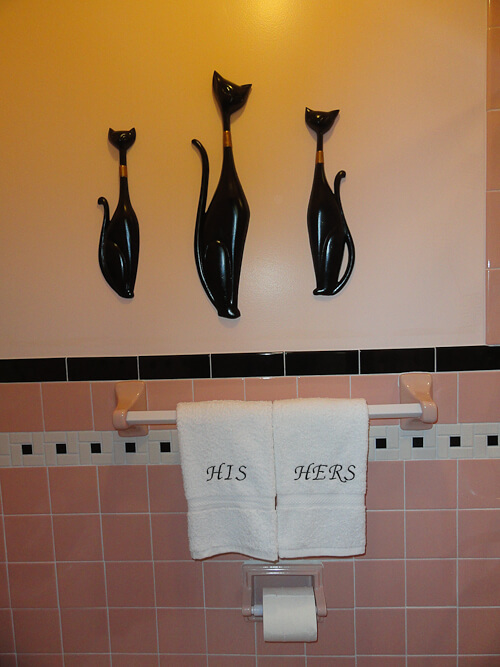 But, I didn’t know better and we bought a house with two bathrooms – neither of which are pink. After reading all about the Save the Pink Bathrooms crusade and drooling over the RR Blog’s readers’ own pink beauties, I decided I might not have inherited a pink bathroom, but by golly, I could build my own. First order of business was convincing my husband of the idea. My husband is a Harley ridin’ guy’s guy and I thought I would have to whine, pout, nag, threaten, and blackmail to get my way. However, when I gingerly approached him with the idea, I was dumfounded to hear him say, “That’s fine – I don’t care.” That’s all it took. With a green light in my pocket and the RR Blog’s inspirational ideas in my head, I started designing. The first step was deciding on a coordinating color. I noodled around with pink and brown and pink and burgundy, before settling on pink and black. 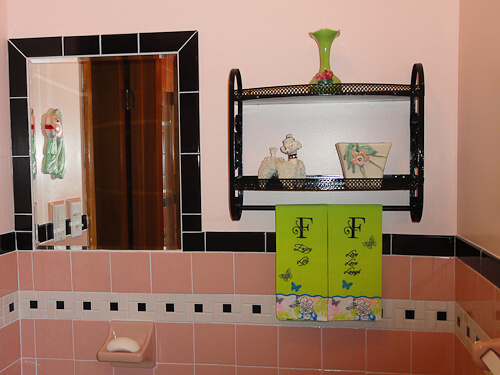 I was initially concerned that black would look very harsh up against all the pink, but after studying pictures on the RR Blog and internet, I decided it made the quintessential 50’s bathroom and I owned it all the way from that point on. It didn’t hurt that the black tile I needed was a stock item at Lowe’s and could be purchased at a much lower cost than a special order tile. I found the black and white mosaic tile used on our floor at Lowe’s [American Olean Chloe pinwheel tile with black dot], and while I would have given my right arm to have some of the wonderful vintage mosaic tile floors I’ve seen on the RR Blog, I decided that this was a very close second. I want to give a shameless plug to my husband who came up with the idea to add a strip of the same mosaic on the wall for an accent row. Yep, same ole Harley ridin’, guy’s guy came up with that all on his own. Brilliant! I agonized over what to do with the top half of the walls and even considered wallpapering, but DH hates wallpaper and I didn’t think he would go for it. He didn’t. After considering all sorts of color options, I thought the only real viable complimentary color to pink and black was a slightly lighter shade of pink than the tile. When selecting the color, I uncustomarily nailed it on the first try. It’s Valspar “Sugar Pink” purchased at Lowe’s. We did use a very high dollar primer on the walls that we purchased from a specialty paint store that is specifically designed for bathrooms since it’s such a wet environment. 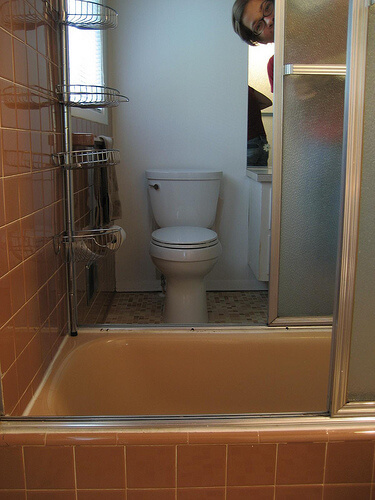 However, this is a 2nd bathroom, so other than the toilet, it gets very little water use, but better safe than sorry! Seriously. It’s rare that I get the right color on the first try. My husband and I even had to re-paint our family room three times before I was happy. As you can see from the before pictures, we had a chrome toilet paper holder, towel bars, etc. I really, really wanted ceramic so I went on an Ebay hunt. I found some that looked the same shade of pink, but holy cow, there are like a million shades of pink (as I discovered when looking at paint samples), so it was a crapshoot when I hit “Buy It Now” on Ebay. I was half afraid to open the box with the tile sample in my hand, but the Renovation Gods blessed me with a toilet paper holder, soap dish and towel bar brackets that were the…exact…same…shade…of…pink. I guarded them like the Hope Diamond until installation day for fear that one would get damaged. I knew I would never be that lucky again. With all the supplies on hand, we started demolition right after the vintage aluminum Christmas tree came down in January. We discovered that the tile we had (which we could tell had been painted) wasn’t ceramic at all, but rather plastic. 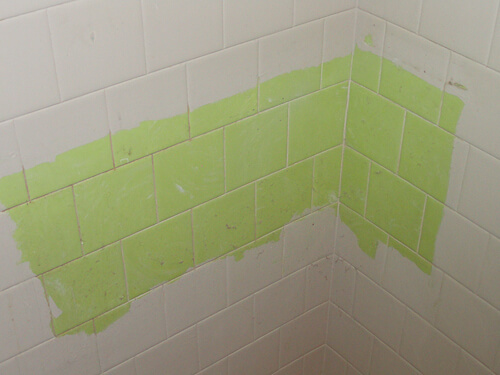 There behind where the toilet once stood, was the original chartreuse plastic tile. Had it not been painted in the 80’s, I would have embraced it and been happy to have this original unique color. But as you can tell from the pictures, chartreuse had been converted to bland off-white, so hundreds of vintage plastic squares of tile met their demise. Of course, there’s no saving sheetrock when you remove tile so we took everything down to the studs. As is often the case when you demo a room where water is the main feature, we discovered the subfloor was mildewed and rotten so it also had to be removed. You know how we talk about how everything was built to last back in the 50’s, well, the builder hammered a nail in that subfloor at about every 2 inch intervals. The floor came up more in splinters than sections. We also took up the original ceramic shower floor which we discovered was on top of 4” of solid concrete which had to be sledge hammered apart. And yes, my husband really did break up all that cement in flip flops! DH gets 100% of the credit for all the demo. Every tile, every bit of sheetrock, every splinter of wet subfloor and every chunk of cement was removed by his hands. Thank you DH! My husband and I fancy ourselves as pretty decent DIYers, but nothing we’ve done has been as frustrating as installing and grouting tile – at least for me. Admittedly, this process was made more difficult by my slant toward perfectionism, but wow, it’s nowhere near as easy as they make it look on HGTV! Are there mistakes in our work? You bet. Did I fret/obsess over it? You bet. But in the end, I know none of my friends or family will be sitting on the toilet critiquing each grout line so I’m over it. We had a hard surface shower pan custom made for us. This shower isn’t a standard size, so nothing on the market worked. We have a plumber friend who suggested we go this route. You can get a better look at it in one of the pictures I sent of me standing in the shower. It’s secured by sitting on a bed of mortar. 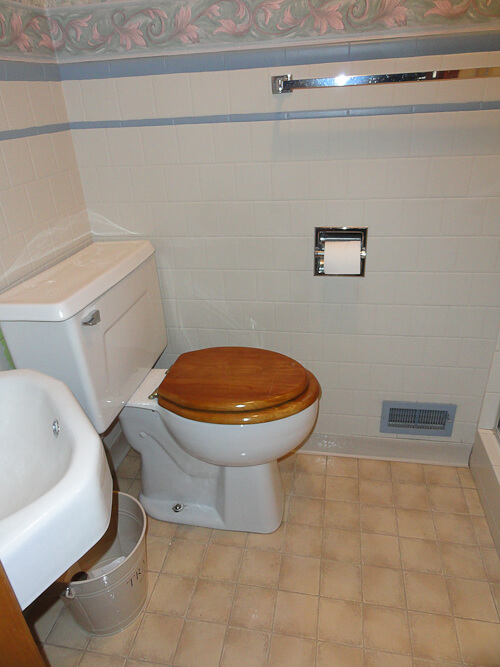 Our plumber friend did help DH install this as it was definitely a two man job – very, very heavy! The shower doors were a special order from Menards – they are not stock so don’t expect to see them on the show room floor, but they can order unique designs and we found they have a better selection at a lower cost than Lowe’s or Home Depot. 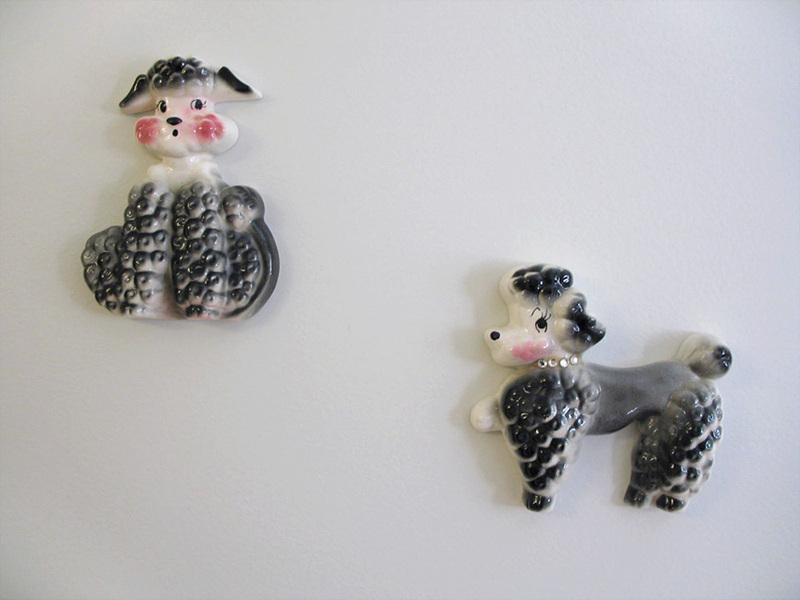 The chalkware fish are a combination of Ebay and local antique store finds. 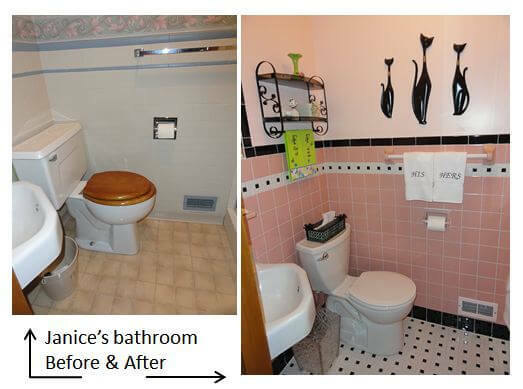 So, that’s my story of how I created a pink and black 1950’s bathroom. Pam, you saw me through my kitchen renovation last year, and you were with me every step of the way in the bathroom renovation this year. I can’t wait to see what room you and I work on next. 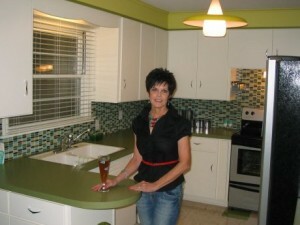 Janice, I think you are serious serious contention for the Retro Renovator of the Year. You and DH are amazing. Might I also point out: Can everyone see how all that pink tile — bouncing its pastel perfection onto Janice’s already glowy face — just lights her up even more? Pink bathrooms = Retro Botox, yet another reason to love them. Well done, Janice and DH. 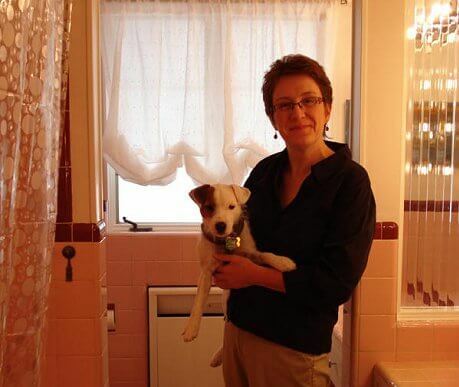 And, thank you, too, for the fantastic write up, including that Menard’s shower door,which I love, and a great tip on a paint color we can all just snarf right up, no fuss no muss. As we discussed via email, I still don’t understand how you got your shower pan made. Possible to get more info on that??? xoxo, you rock! 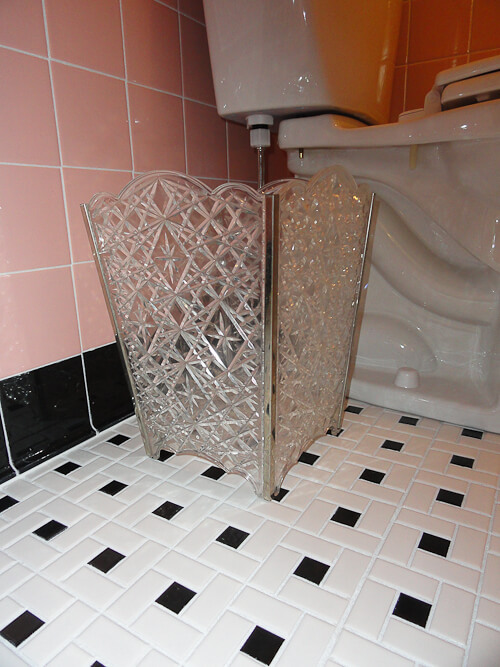 Love the retro pink bathrooms and love to see this one, in particular, with the classic black trim! 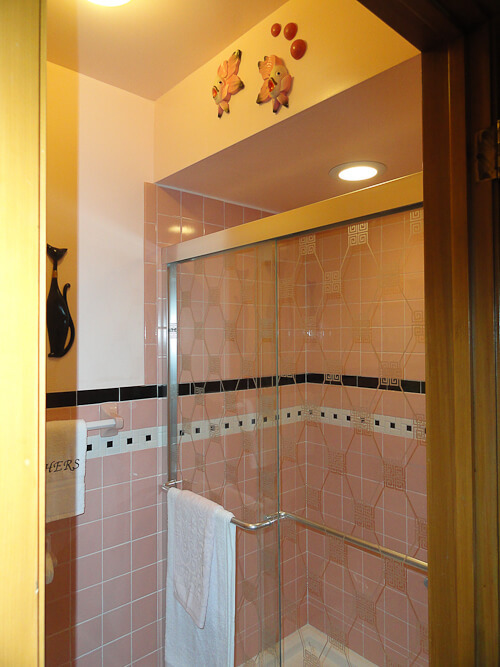 My grandmother’s bathroom in their Borough Park, Brooklyn home had a wonderful pink bathroom that I remember with the deepest fondest nostalgia. The last time I saw it must have been 40 years ago, but I remember the gleaming, shiny, rich, deep pink of the tiles and the strong black bordering tiles, the matching mosaic on the floor, the shower stall – tiled in pink and black 360 degrees up and down! 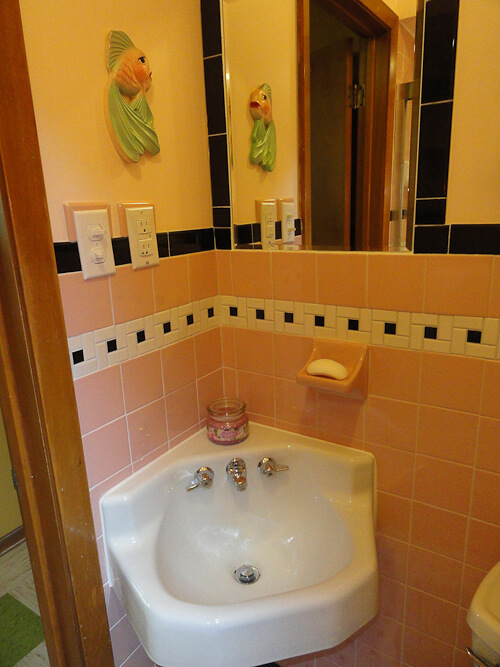 – the wonderful pepto bismal pink sink and the vast expanse of the pink tub. The little cubbies inset into the tile wall for soap and toilet paper holders, the porcelain tile towel rack holders and the toothbrush holder … And all of it wrapped in the aroma of a fresh mini-bar of, Maja soap in its flamenco dancer black and red wrapper on the porcelain tile soap dish. Miss you Gramma! Wow! What an astonishing bathroom. I love retro bathrooms and have always wanted to rebuild my own midcentury bathroom to reflect that look. But I could never find a supplier for that tile and especially the trick tile covings. Thanks for your story and tips..you have fired me up to do it like you. Hi: LOVE what you’ve done with your bathroom!!!! 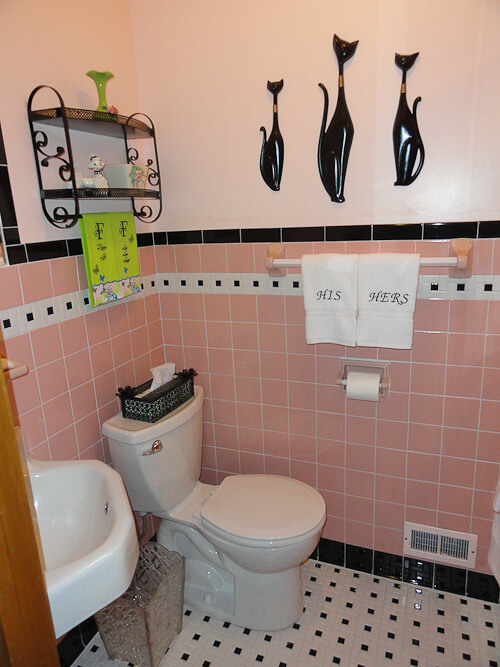 Wanted you to know it was mainly you who inspired me to keep our “fixer upper” house 50s pink and black bathroom we were “blessed” with..lol…Seriously, we bought this house that had “linoleum” on the bathroom floor and some kind of weird “paneling” with poka dots above the pink (with a few black) originals tiles. So, the first thing we did was to take off that “paneling stuff” and painted the wall “sugar pink” and BOY OH BOY..you were SOOOOO RIGHT..it was PURRRFECT..lol..at first thought not pink enough but now…I see the light it just enough “tones down” the pink yet holds the “glow”..we are redoing the original pink multi tile (with like creams) floor with the black and white one you did (would be too hard to keep it in tact as we have to remove the subfloor which smells of dog pee..long story..lol..but the pink (and black) tiles we have are in pretty good shape..the cast iron white tub is in good shape as well and we have the original towel bars, built in soap dish and tooth brush holder..and thanks to you I am feeling LUCKY B/C OF THIS now..lol..so we replaced the ugly 80s vanity sink with a $20,99 vintage cast iron or porcelain wall mount sink we got from a doctors office..and will one day maybe do the glass door…we are now looking for a cool retro medicine cabinet and have found several for sale under $100 with shipping and we plan to do painted on or clip art in 50s style..maybe black and white (touch of pink too??) of like James Dean, Marilynn Monroe, Audrey Hepburn…and or Looney tunes..and / or batman and catwoman ..cannot decide..yet…but wanted you to know your design was SOO nice it inspired me not to be wasteful I(either financially or green footprintwise) and to use what we have..even my husband surprisingly is kind of on board and psyched..(like yours I think you said gave you the go ahead) I think it was the spending less money (only about $60 for the floor, $20 for the sink (still want new fixtures as these look too doctors office commerciallish) and the cost of pain under $20,00 and the fact we could so something cool for him too like batman or marilynn monroe (he wanted Petty Paige pin up…a few.but idk..still may through one in if I can have a clip of Mr. James Dean..and maybe pepe and penelope or bugsbunny and daffy..lol ty again..will try to post pics when done..contact me to remind me if you want..
OMG, Thank goodness I read your story! Your bathroom is GORGEOUS. EXACTLY what I want! Pink and black! Thank you so much for your tips, because I was having a hard time with finding a supplier for Pink tiles.Will be calling B & W tile company tomorrow to get that exact pink tile! I cannot wait to re-do my bathroom! Beautiful tile and love the corner sink!